FRP Products — Prairie Panels Ltd.
Fiberglass reinforced panels are tough, easy-to-clean, impact resistant surface, low maintenance wall panels used to finish your utility and service areas. FRP will not rot, stain or corrode, dent or splinter and will not support mold or mildew. 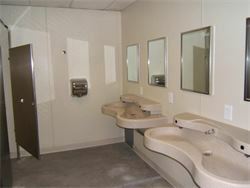 Ideal for high traffic areas where painted walls can not withstand daily wear and tear. FRP panels reduce maintenance and repair costs to have drywall patched and repaired as well as painting year after year. In Kitchen and Bathroom areas it prevents moisture from penetrating the drywall causing the growth of mold and mildew. Perfect product for walls and ceilings. We have installed in various hockey arena and recreations buildings across Saskatchewan and Alberta. We are a Saskatoon based installer for FRP. Have completed many Saskatoon and Saskatchewan based FRP Projects in Restaurants, Commercial Kitchens, Industrial Manufacturing Facilities, Walk in Freezers, Restrooms and Showers. Description: FRP is a composite material made of a polymer matrix reinforced with fibers. FRP is commonly used in the aerospace, automotive, marine, and construction industries. Application: FRP is manufactured and tested to perform in locations such as: commercial kitchens, public restrooms, hospitals, schools, correctional facilities, restaurants, car washes, meat and dairy facilities, coolers and freezers, supermarkets, clean rooms and laboratories. Comes in Smooth or Pebbled Textures. Typically in White but can come in assorted colors as well. Coordinating Vinyl or PVC Moldings are also available. As well Aluminum or Stainless moldings can be used in some applications. Call or email for price quote for FRP Sheet material or installation.